The first two stages are maybe a bit too similar, but they do give opportunities to create gaps, and even if a strong time trialist takes over the lead on stage 4, there's still a good chance to strike back on the two coming days. The start list looks as good as usual with guys like Landa, Quintana, Nibali, Uran, Bardet, Yates, Alaphilippe, Kwiatkowski, Roglic, Zakarin and so on. Also Richie Porte plans to return from holiday by the look of it. The wildcards for the race went out to the three Spanish PCT outfits and Cofidis. Two days before the Itzulia, the week of Basque Cycling starts with the GP Miguel Indurain on Saturday. The race is live on Eurosport 2 on from 15:30 cest or so. An almost 20km, pan flat ITT. Initially Quintana was with them but then dropped like a stone. Landa nowhere, Little Richie 7 minutes behind. so "3.4k at 8.4% is a bit misleading. Yeah, that was a surprise there, but it's the sort of thing we sometimes see with a tough Day 1. No boring sprint stage to kick off here and what a terrifying final descent that was. Suited Alaphilippe but a very nice result for Roggers, who must be hot favourite now even this early into the game. Really nice little stage, but they could have made the finish a little bit more interesting by doing some of the town streets instead of this back-garden variety. That doesn't subtract a lot from the total. If a prize for parcours design is handed out, this stage should be nominated. Nothin' new about the results really, that's why I write about the parcours. Agree re Kwiatkowski: not sure he and De La Cruz had read the roadbook properly for that stage, but the Pole is looking very sharp ahead of the Ardennes. Would have expected more from Matthews in that sprint. Normally you would say he had so little competition there but apparently he got boxed in or didn't have the legs. McCarthy is quick but not so quick. He now also has quite a healthy gap in GC, but with two tough stages to come and the pretty poor team he has, it should be a fun weekend. And even if they can't drop Roglic, with 14 riders within 1 minute (and Alaphilippe ahead, who may very well struggle) it should be a very entertaining fight for the podium nonetheless. 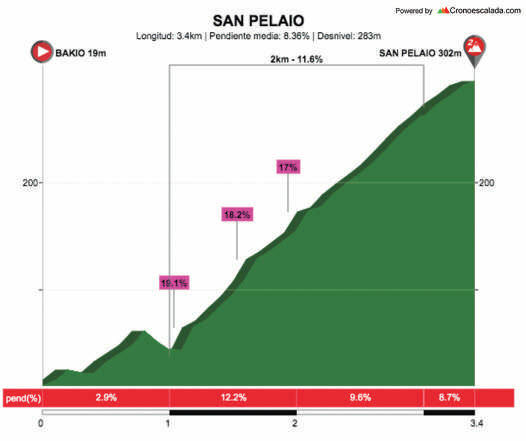 Today the climbs come pretty far away from the finish, but I think we will still see some fireworks. great stage yesterday, it definitely turned out to be a good decision to move the time trial to the middle of the race . Movistar (mainly in person of de la Parte) put the hammer down on the Elosua, isolating Roglic, and the Basque duo of Landa and Brother Ion attacked on the penultimate climb and bridged to their team mates Rojas & Padun from the early breakaway ahead. In the end they couldn't shake off Roglic, but if you come from 7th and 10th in gc and move on the podium in your home race there's not much to complain about I guess. Carlos Verona was the last to be caught from the early breakaway on the descent to Eibar while Fraile initially was dropped by his compatriots relatively early, but he somehow managed to glue to Roglic wheel when the leader's group passed him on the last kilometers of the final climb and win the sprint in the end, celebrating his first win for his new team, on home soil. Also Gorka Izagirre, Rudy Molard and Romain Bardet dropped out of gc contention. Alaphilippe was also struggling but managed to limit his losses with the help of team mate Enric Mas. Stage win for Enric Maas from the break. Maas was free to go after Alaphilippe crumbled early on. Movistar did all they could, managed to get a 5 to 1 numerical superiority vs on the 2 last climbs, and finally break Roglic on the last climb - too late. Roglic was very tired but kept it together somehow by not panicking . That's chapeu beret for Roglic, congrats on his first GC win at WT level!